Jonathan Lucroy led a 16 hit attack in Philadelphia to open a 4 game series against the Phillies. Lucroy went 4 for 5 with 2 RBIs and 2 runs scored. The Brewers matched their season high with 16 hits. Jimmy Nelson struggled early, giving up 2 runs in each of the first 2 innings, but settled down after that. Aramis Ramirez hit a 2 run double in the 6th and Lucroy drove him in to give the Brewers a 6-4 lead. Lucroy capped the scoring off in the 8th with another RBI single. The Brewers took game 1 by a score of 7-4. Game 2 of the series started as a pitcher’s duel between the Phillies’ Cole Hammels and Taylor Jungmann of the Brewers. Jungmann gave up 3 runs (2 earned) in 6 innings and Hammels went 7 innings, giving up only 2 runs. The Brewers got on the board in the 1st inning with a 2 run single by Ramirez, but Hammels shut down the Brewers after that. The Phillies scratched out a run in the 2nd and another in the 3rd before Carlos Ruiz gave them a lead with a solo home run in the 6th. That’s when things got interesting. With 2 outs in the 8th inning and a runner on first, Carlos Gomez swung and missed at an 0-2 pitch. Unfortunately for the Phillies, catcher Carlos Ruiz had called time, and the strike did not count. Gomez went on to single to keep the inning alive. The Brewers managed to score 2 runs after that to take a 4-3 lead. Francisco Rodriguez came on to close out the Brewers 3rd straight victory, which gave them a 14-14 record in June. 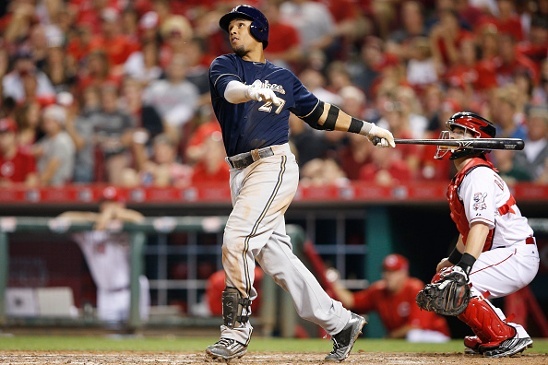 The Brewers continued their hit parade on Wednesday, this time with a season-high 17 hits. Kyle Lohse even got into the action, becoming the 5th Brewer pitcher to record 3 hits in a game. He joined Parra and Scooter Gennett as a trio of Brewers with 3 hits and 2 runs scored. Lohse gave up 4 runs in 6.1 innings, but the Brewers managed to win 9-5 for their 4th straight win. Adam Lind hit a 2-run home run in the 1st, and 3 more Brewers tallied at least 2 RBIs. The Brewers came into Game 4 looking to earn their first series sweep of the season. They jumped out to an early lead with a 3-run first inning, and led 7-4 going into the bottom of the 7th. Jonathan Broxton came in to relieve Matt Garza and gave up 2 hits, both of whom scored, and recording only one out. Will Smith was gave up the tying run before finally ending the inning. Both bullpens held firm until the 11th inning. Lucroy doubled to lead off the inning, then scored on Lind’s RBI single. K-Rod pitched a 1-2-3 inning to record his 18th save of the season. The Brewers got their first sweep of the season and pushed their winning streak to 5 games. The red hot Brewers arrived in Cincinnati on Friday looking to continue their winning streak. Parra led off the game with his 6th home run of the season and Lind added another RBI later in the inning. Ramirez hit his 10th home run in the 2nd inning for a 3-0 lead. Lucroy and Gomez added RBI hits in the 5th to extend the lead to 5-0. In the 7th, Gomez hit his first ever grand slam to put the Crew up 9-0. Mike Fiers pitched 7 innings, giving up only 3 hits. Tyler Cravy pitched the last 2 innings and gave up only one run. The Brewers continued their hot hitting with their 3rd straight game of 16 or more hits. Lind started the Brewers fireworks on the 4th of July with a solo home run to tie the game. The Brewers then scored 6 times in the 5th inning and held on to win 7-3. The team “only” had 11 hits, but a bases loaded walk and a bases loaded balk helped the Brewers. Nelson picked up the win and Broxton came in and pitched a much needed scoreless 9th. The Brewers ran their win streak up to 7 games. The Brewers’ Jungmann shut down the Reds batters, giving up 1 run in 8 innings. Brewer hitters once again hit double digits with 13 hits. Parra and Lind each hit home runs in the 7th to fuel a 6-1 win. The Brewers earned their 2nd sweep this week after not getting a sweep in their first 25 series. They finsihed the road trip 7-0, marking only the second time in franchise history that they were undefeated on a road trip of 7 games or more. Carlos Gomez was hit in the wrist in Saturday’s game. X-rays came up negative and he is day-to-day with a contusion. He missed Sunday’s game. Khris Davis started a rehab assignment with the Single-A Wisconsin Timber Rattlers. He is expected to join the Brewers during their series against the Braves at Miller Park early this week. Wily Peralta threw off the mound this week and is looking forward to a rehab assignment. It is not likely that he will be back in Milwaukee until the end of July. Peralta has been out since May 22 with an oblique strain.